Using MegaWP theme you can easily create a modern website for any service providing business with real content. MegaWP is a premium computers repair WordPress theme, tailored to your needs and to the expectations of your clients. Easily edit the real content and compose the page layout with drag & drop page builder. The Visual Composer drag and drop page builder is fast and intuitive to use, making it easy to build and arrange page layouts, the Theme Options panel in WordPress Customizer lets you edit your content in real-time. This means that you can play around with the look and feel of your site with an instant preview, before your changes go live. This business WordPress theme includes Revolution Slider, so you can create stunning slides with animated effects. The MegaWP Mobitech computer repair WordPress theme is an ultra modern template for computer hardware businesses incorporating the latest features and design. The theme is a one stop solution for your online presence especially when people like to search online for their computer fixing job. 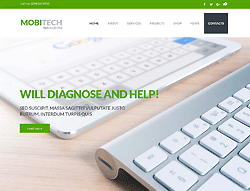 The Mobitech computer repair WordPress theme is by far the most professional theme in terms of layout, design and functionality, to take your personal Computer Repair business to the next level. It features a clean and stylish layout with full-width images that give the homepage quite a cool look.